The Seahawks managed just 73 rushing yards on Saturday, their lowest total since the season-opener against Denver. When they needed to enforce their will, the Seahawks' running game wilted. ARLINGTON, Texas — Five sullen Seahawks sat in a row. Duane Brown. J.R. Sweezy. Ethan Pocic. D.J. Fluker. Germain Ifedi. Twenty minutes after their 24-22 wild-card loss to the Dallas Cowboys on Saturday night, these giant men leaned into their gray lockers, their jerseys stained with blood. Some stared at their phones. Others cut off the worn tape wrapped around their swollen ankles. None spoke. The room was eerily silent, a far cry from the bass-booming celebrations that inevitably followed their 10 previous wins. They didn’t remove their jerseys, as if the fifth quarter might start at any second. As if they didn’t want to leave. As if they weren’t ready for this season with the linemen sitting next to them to finally, frustratingly end. And, like it or not, the running game was a reason why. “It’s a mixture of emotions, man,” said veteran left tackle Duane Brown. “Obviously we came into this game with high expectations. It wasn’t our best performance up front. It wasn’t my best performance. We’d been a strong point (with our running game) throughout the season, so not to be able to run the ball as much as we wanted when that’s been our identity, it’s frustrating. They fought, and they failed. 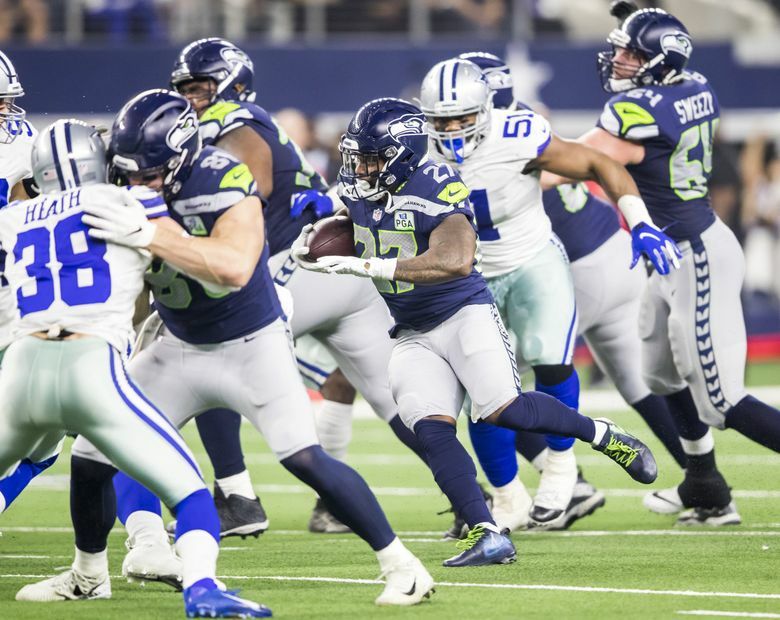 After eclipsing the 100-yard mark in three consecutive games, second-year standout Chris Carson — the reigning NFC Offensive Player of the Month — was stonewalled to the tune of 13 carries for 20 yards. “They did a great job stopping me,” said Carson, whose answers were as short as most of his runs. Carson and Co. were also short on explanations on Saturday night. Against the No. 5 rushing defense in the NFL, the 10-6 Seahawks — who entered the game averaging 160 rushing yards per game and 4.8 yards per carry — managed just 73 rushing yards and three yards per carry inside AT&T Stadium. A Seattle offense that routinely trampled the will of its opponent produced its lowest rushing total since the season opener against Denver. A poor rushing performance yielded more third-and-long situations, which resulted in the Seahawks converting just 2 of 13 third-down tries. Meanwhile, the Cowboys’ rushing offense produced the opposite result. Running back Ezekiel Elliott — who led the NFL with 1,434 rushing yards in the regular season — turned 26 carries into 137 yards and a touchdown on Saturday. With a 17-14 lead and 7:20 left, Dallas mounted a back-breaking 11-play, 63-yard touchdown drive to essentially seal the win. Fifty-four of those 63 yards came via the run. On Saturday, the Cowboys took Seattle’s offensive formula and stuffed it down their collective throat. When they needed to run, they ran. When they needed to score, they scored. When they needed to stuff Carson, well, you know what happened. The 5-foot-11, 222-pound running back never produced more than a five-yard gain. That’s why there was silence in the Seahawks’ locker room on Saturday night, why Carson’s answers were abbreviated and all those offensive linemen sat stunned at their lockers. After winning six of their last seven games, the Seahawks’ improbable run was over. This is what a deflating Dallas disappointment looks and sounds like. Five offensive linemen sat there, sullen. Then, eventually, they left the room.